Keihan Electric Railway is a private company that operates a number of rail lines in the Osaka, Kyoto, and Shiga areas. None of these rail lines pass through Osaka Station or connect with Umeda, and they are not covered by the Japan Rail Pass. However, the Keihan Main Line is very convenient for commuting between certain areas of Osaka and Kyoto, and is especially useful for several major tourist locations in Kyoto. The Keihan Main Line proper runs between Yodoyabashi Station in Osaka and Sanjo Station in Kyoto. In the north of Kyoto the Keihan Main Line is extended by the Oto Line from Sanjo Station to Demachiyanagi Station. Effectively the Oto Line and the Keihan Main Line are the same thing. In Osaka, the Nakanoshima Line from Nakanoshima Station connects with the Keihan Main Line at Osaka’s Temmabashi Station. Some trains run between Yodoyabashi and Demachiyanagi, and others run between Nakanoshima and Demachiyanagi. If you are returning to Osaka from Kyoto, you should if check if your train’s final destination is Yodoyabashi or Nakanoshima, in case you need to make a transfer at Temmabashi Station. The Keihan Main Line is a useful line for commuters traveling between Osaka and central Kyoto. A Limited Express train will get you from Yodoyabashi Station to Sanjo Station in 55 minutes for 410 yen. Also because the Keihan Main Line runs from the south to the north of central Kyoto, and because its stations are reasonably close to many of Kyoto’s most iconic sightseeing locations, this line is very convenient for tourists. 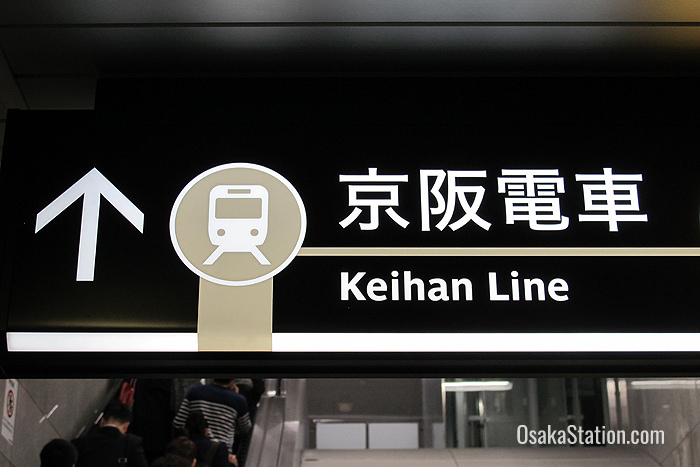 The Keihan Man Line does not connect directly with Kyoto Station. The closest transfer point is at Tofukuji which has both a JR and a Keihan Station. Kyoto Station is one stop north of Tofukuji. However, as Kyoto Station is not centrally located you may not need to go there. 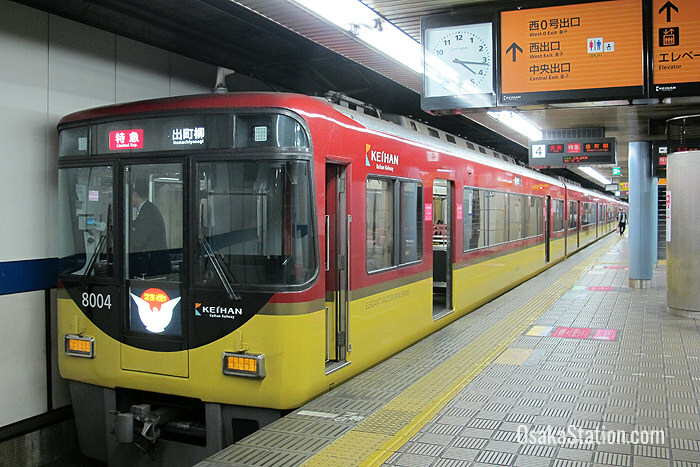 If you simply want to see the main tourist locations, then a sightseeing pass for the Keihan Main Line might be ideal. There are 42 stations between Yodoyabashi and Demachiyanagi. The following are the stations you are most likely to visit. 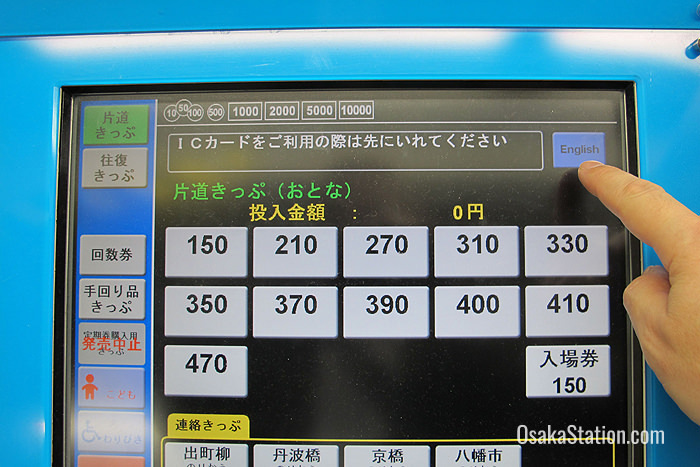 The fares and travel times given below are from Yodoyabashi Station. This station is the first transfer point between the Keihan Main Line and the Nakanoshima Line. Kyobashi is a large commercial and entertainment district in Osaka city, packed with bars and restaurants. There are actually three stations here, so it is an important transfer point between the Keihan Main Line, and several lines runs by JR West (the Osaka Loop Line, the JR Tozai Line, the Katamachi Line) and by Osaka Municipal Subway (the Nagahori Tsurumi-ryokuchi Line). 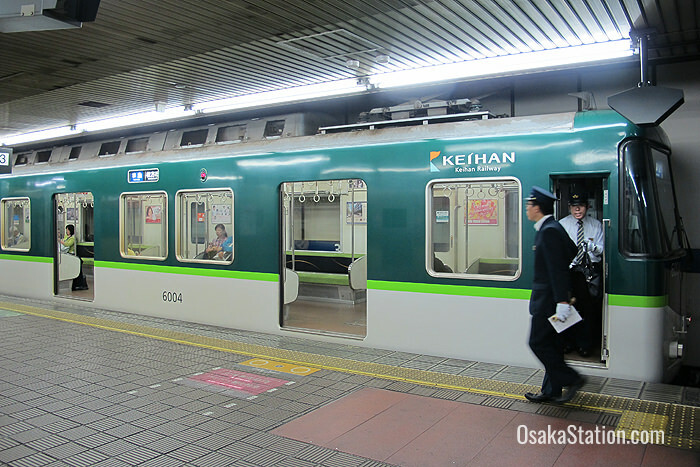 Keihan Kyobashi Station is also a transfer point between the Keihan Main Line and the Nakanoshima Line. How about a day at the races? Yodo Station is a five minute walk from Kyoto Racecourse, “the premier racecourse of Western Japan”. Depending on your final destination and the train you are riding, you may need to change here between Limited Express and Local trains. You can also transfer here to the Kintetsu Kyoto Line. Tofukuji Temple is a spacious Buddhist temple complex 10 minutes walk from Keihan Tofukuji Station. It is famous for its gardens, in particular its moss garden, and for maple leaf viewing in the autumn. You can also transfer here to the JR Nara Line at JR Tofukuji Station. As Keihan Electric Railway is operated by a private company it is not covered by the Japan Rail Pass. However, a one or two-day discount sightseeing pass for the Keihan lines in Osaka and Kyoto and a one-day pass for Kyoto are available. These passes also come with a free set of coupons for some of the main sightseeing locations on the route. If you are planning to travel between Keihan stations a lot, then this is certainly a good option. Visit the official Keihan Railway website to find out more. Visitors from overseas can also get a Kansai Thru Pass (also called the Surutto Kansai Pass) for two or three days. This covers not only the Keihan Main Line and Uji line but many of the private railways, buses and subway systems in Osaka, Kyoto, Shiga, Kobe, and Nara. This pass cannot be used on JR Railways however. Visit the Kansai Thru Pass website to find out more. The Keihan Main Line is served by a bewildering variety of train types. The main ones are: Limited Express, Rapid Express, Express, Sub-express, Semi-express and Local. You should be careful to get on the right train for your stop. If you are traveling between Osaka and Kyoto, a Local train would obviously take too long. However, the faster trains might skip your station, so you may need to transfer to a Local train along the way. The official Keihan Railway website has a guide to train types, but to find a suitable train quickly and easily it is best to use an English language online route finder like Jorudan or Hyperdia. You can find timetables, and station maps for the Keihan Main Line here. The official Keihan Railway website also has a free downloadable route map of all the Keihan lines and stations. 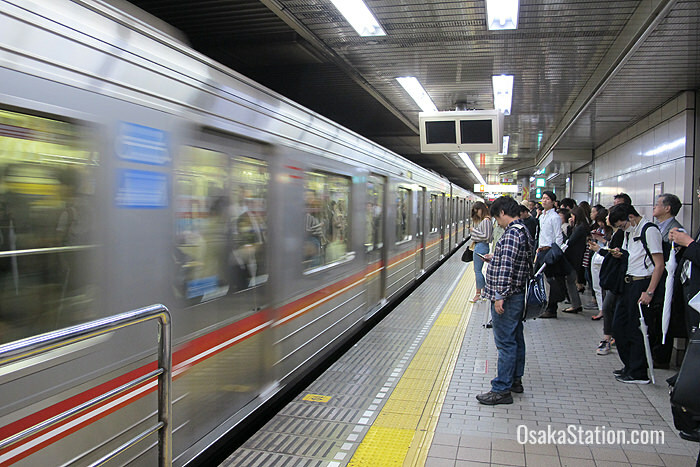 To access the Keihan Main Line from the Osaka Station area, simply transfer to the Umeda Subway Station for the Midosuji Line. 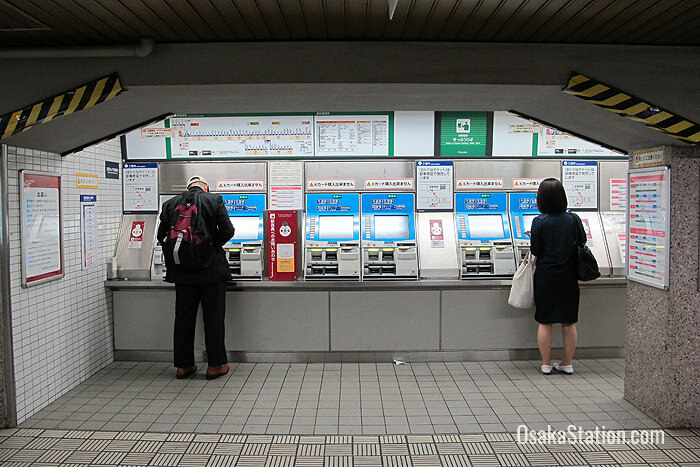 Yodoyabashi Station is just a 3 minute train ride away, and the fare is 180 yen. Once you get to Yodoyabashi simply follow the signs to the Keihan Line.